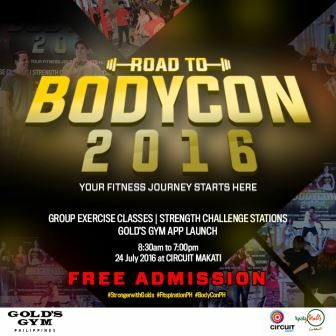 With a tagline of "Your Fitness Journey Starts Here," Gold's Gym, the country's one of the leading fitness centers is spearheading another fitness class dubbed as the "Road to BodyCon 2016." This is actually the second installment of the said fitness event following its success in its first edition held in Alabang last June 2016. Just like the previous, "Road to BodyCon 2016" is offering a FREE admission. It will be held in Circuit Makati this Sunday, July 24, 2016. The event begins at 8:30am until 7:00pm. Aside from that, Gold’s Gym is launching their new mobile app to help you track your progress. And by simply participating in any of the activities, you get a chance to win a 3-MONTH GOLD’S GYM MEMBERSHIP! For more updates on this event, keep track on the following hashtags: #StrongerWithGolds, #FitspirationPH, and #BodyConPH.